As citizens horrified by the apparent murder of 298 passengers on board Flight MH17, and by the indiscriminate killing of civilians in Gaza, we call on you to immediately suspend all UK licences for the sale of arms to Russia and Israel. Only a total weapons ban will ensure that British firms are not profiting from the death and destruction in Eastern Ukraine, Syria and Gaza; this is the moment for the UK to show leadership and set an example for the rest of the world to follow. 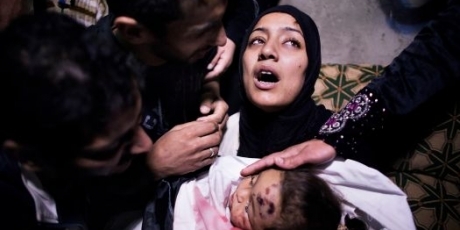 415 children killed in Israel's attacks on Gaza. 298 airline passengers shot out of the sky, suspected culprits: Russian-armed separatists in Ukraine. Outrageously, the UK’s still selling weapons - including bomb and missile parts! - to both Israel and Russia. But now’s our best chance to stop it. Right now David Cameron’s under intense pressure to suspend all arms licenses to both countries - a senior minister just quit and others are in open rebellion. He's announced a review, and vowed to stop some arms sales to Israel if fighting resumes. But given his government's cosy relationship with mass weapons-makers like BAE systems he'll only commit to firm action if we give him no choice. This is our moment -- if we launch a huge public outcry we can supercharge the pressure already piling on the PM. But we need to act fast as the government review's happening right now. Click below to stop the sale of weapons that murder innocent families, and when we reach 50,000 we’ll work with MPs from all parties to force a comprehensive ban.